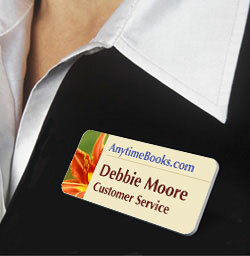 Stylish, affordable name badges, with your personal touch. 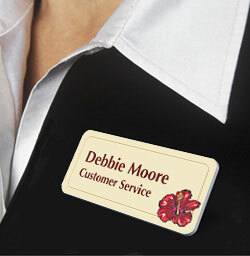 Our professional name badges can turn a simple hello into a final sale. We want you to look your best, so browse our full range of options below. From rotary or laser engraved plastic to a wide range of brass badges, you can customize these with different text, colors, or even a logo. Add important company info, employee names, and titles. Questions? Feel free to give us a call. We can help you design the perfect way to introduce yourself. Get magnetic backings, lanyards, bead chains, strap clips, holders and slot punches with best prices online! With Badge Buddies you can spot everyone's title or department. It hangs just below your regular ID badge. Find below the most popular badges we have to offer. 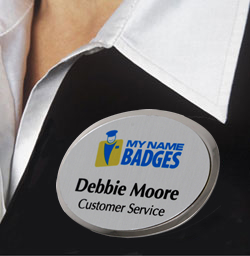 Choose between engraved plastic to full color badges with an elegant metal finish. • No minimums! Get bulk discounts. • Sizes from ¾" x 3" to 2" x 3"
• Available in 3" x 21/8"
Professional and cost-effective, with hassle-free customization. Choose a type, pattern, color, and size. • Rotary engraved, square corners. • Affordable and professional, in 4 sizes, and 20 different colors. • Laser engraved, rounded corners. Several font and border options. • In 4 sizes, and 30 different colors. • Sleek black outer frame and recessed inner plate. • In 4 sizes, and 32 different colors. • Laser engraved or rotary engraved. • Plastic framed in classic, metallic gold or silver holders. • Laser engraved, distinctive shapes. • In plenty of colors and unique styles for your employees. • Show off your logo or design. • In 3 standard sizes, and 20 different colors. • A customer favorite. Digitally printed with 4 sizes to choose from. • No logo fees or setup charges. • Digitally printed with a premium gloss laminate. Want something with a little more shine? Sturdy badges won’t melt, deform, or break apart. • Thick, heavy-duty, oxidized brass. • Multiple sizes. Easy to customize. • Sleek brass, with metallic surface. • Sublimated print stands out. • Sublimated print on aluminum, with an optional full-color logo. • Laser engraved, slender brass. • Frosted, with a contrasting border. Compare our costs to see how much you'll save. And, our time-expiring badges are a huge favorite of security professionals. • Personalize to include your company name and logo. • You may write or print on these badges at home. • Great for schools, hospitals, clinics, events, and more. • A quick, low-cost way to identify your visitors. • Make a positive impact on the people you meet. • Easily make durable, self-laminating badges. • Includes a holder, elegant domed cover, laser printable inserts, and an adhesive magnetic clip. • Feature a title or department name to hang in the same clip. 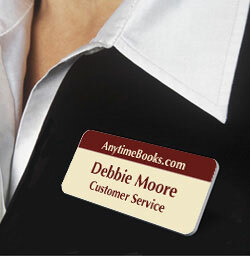 • Pair your badges with a nameplate. • In a variety of materials, like brass and plastic. • ID badges for your entire office. • Customize, or choose a design. • Lanyards, chains, strap clips, and slot punches. Best prices online. • Full color or low cost tags. Sold to 100s of schools and hospitals. • Great prices on Evolis compatible blank PVC cards for ID badges. • Print it yourself and then seal it up. • Print durable badges on both sides.